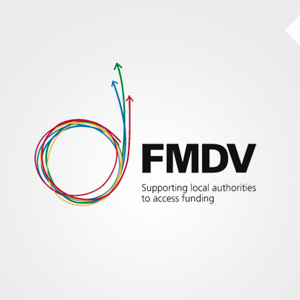 In November 2011, FMDV , an international network of cities which aims to strengthen solidarity among local authorities while increasing their financial capacity, and Evensen Dodge International Inc., a global public finance advisory firm, entered into an international partnership. Through this collaboration, FMDV and Evensen Dodge International are pursuing sustainable financing strategies, specifically to mobilize private sector financing for the development of creditworthy cities. The Cities Funding Corporation was created as an independent firm having no undisclosed direct or indirect connections with or ties to any investment banking firms, lenders or other financial institutions. The CFC is dedicated to facilitating access to market-based financing through a set of complementary services and approaches. The consequences of the global financial crisis have demanded a revision of municipal revenue bases, an improvement in the policy framework of public-private partnerships, policy options to mitigate the impact of the economic crisis, and financial policies that allow local borrowing and access to local capital markets. Local financial innovation is increasingly being used to strengthen public finance and borrowing is one of the primary ways of enhancing local investment to meet local needs. Local government borrowing, however, can encounter various difficulties in its implementation. Some local governments are affected by a lack of creditworthiness and the high costs of debt financing while others, which are more financial solvent, cannot access markets because of central government policies. These limitations can exacerbate the effects of the economic crisis on local authorities, as they become responsible for the improvement of local public infrastructure in the context of decentralization. Given this challenging context, local authorities need new partners to strengthen cooperation amongst each other and support innovation in financial engineering for urban development. The Cities Funding Corporation (CFC) serves both purposes. The CFC operates under agreements with FMDV member cities that are seeking private financing for capital improvement projects (typically large urban infrastructure investments). The CFC assists the city to mobilize financing from their domestic capital market or financial community through bonds, long term loans, or public-private partnerships. A small part of the funding raised with the help of CFC is in turn contributed to FMDV in solidarity with other cities to provide them with technical assistance. The primary objective of the CFC is to enable local authorities (particularly municipalities in emerging countries) to access domestic capital markets to finance their urban development projects. Debt financing facilitated by the CFC allows local authorities to pursue their own priorities and plans for development. The independence of the CFC assures that financial institutions have to compete for the opportunity to invest in a city, and CFC advice reflects only objective judgment of what is in the best interest of the city. Managed by highly experienced and internationally recognized public finance advisers, the CFC guides local authorities to mobilization of private sector financing in their local currency and diversification of their sources of financing for sustainable urban development projects. Furthermore, in a time when cooperation is more important than ever to overcome challenges brought on by the fiscal crisis, this financial mechanism promotes solidarity amongst the members of FMDV with approximately one quarter of one per cent of each transaction benefiting a fund to provide financial expertise and feasibility studies to other members of the network that lack the means and/or capacity. 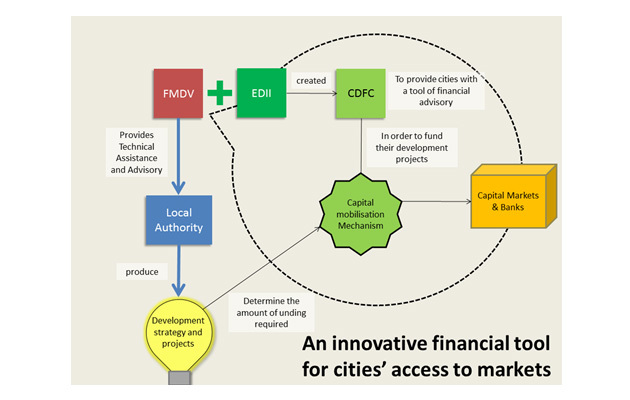 This Technical Assistance Fund allows FMDV to leverage funds for local development strategies, capacity building activities, and studies that benefit and contribute to the urban development of FMDV’s member cities through active, rather than passive cooperation. Financial transactions that contribute to this fund can take the form of bank loans, syndicated loans, bond sales, or public-private partnerships, among other models. In addition, a Transaction Support Fund will be built up with voluntary contributions, including solidarity contributions from FMDV members. This fund enables FMDV and CFC to provide financial support to cities on a cost-reimbursement basis so that they can defer pre-financing costs until their transaction is completed and roll these costs into the long-term financing. Why support and be supported by the CFC? Providing seed money for the Transaction Support Fund or undertaking transactions through the CFC displays solidarity with the principles of sustainable, resilient, and inclusive urban development in cities around the world through this innovative collaboration between an international network of cities and a financial advisory firm. Through grant funding, which provides seed money for this fund, international foundations, donors, and development finance institutions can empower cities to prioritize their own projects and obtain financing for them. A small amount of grant money facilitates a large amount of financing, increasing the resources available to enable physical improvements in the world’s cities. The work of the CFC for one local authority is leveraged to benefit other local authorities in optimizing their urban development in a sustainable, resilient, and inclusive way. This partnership allows for the advancement of wide international urban development interests such as accessing and managing market-based finance and public-private partnerships, strengthening fiscal decentralization and transparency, and establishing favourable credit ratings for local authorities. What services are offered by the CFC (overlook)? A variety of expert services are put at the disposition of cities by cities through the partnership forged between the FMDV and Evensen Dodge International. The successful mobilization of long term financing through bonds, public-private partnerships, or bank loans involves a precise process that must be carefully managed. The CFC provides cities with the necessary financing skills and experience to manage these transactions and is prepared to provide any or all of the required services. The CFC works to coordinate all work products as a financial advisor to the local authority to allow for an optimal financial transaction and management of financing participants. CFC’s experts accompany local authorities through all phases of the transaction from the preparation and negotiation of the financing timeline as part of the pre-sale analysis, to coordinating and overseeing the transfer of funds to the city at closing. Throughout the process the CFC monitors all service providers and the progress of the engagement to ensure a stable financial transaction that contributes to sound urban development and city-to-city solidarity. Assist with the on-going development and implementation of the city’s capital improvement planning process and debt management guidelines by reviewing legislation and plans and offering suggestions and alternative models. Analyse the city’s credit rating position, assist with improving current credit rating over time, and prepare rating presentations. Review all outstanding city debt and make recommendations for debt refinancing when deemed necessary. Conduct a thorough analysis of the feasibility of any unsolicited financing proposals. Organize the planning and development phase of municipal bonds, public-private partnerships, or long-term loans in terms of prerequisites, feasibility studies, analysis of economic and capital market conditions, selection of ancillary service providers, procurement of a favourable credit rating, and preparation of a timetable. Coordinate the closing phase with a post-sale analysis. Consulting services on refinancing existing debt when market conditions are determined to be favourable. Assistance in evaluating financing proposals received by the local authority and determining their feasibility. Preparing debt management policy guidelines to meet the city’s financial objectives. Advisory services to provide capital market information and prepare special studies even when no debt issuance is pending. Who is the CFC serving? CFC services assist creditworthy local authorities that want to obtain long term private financing for their projects on the best possible terms. In 2013, the CFC entered into discussions with cities that may want to make use of the services outlined above. 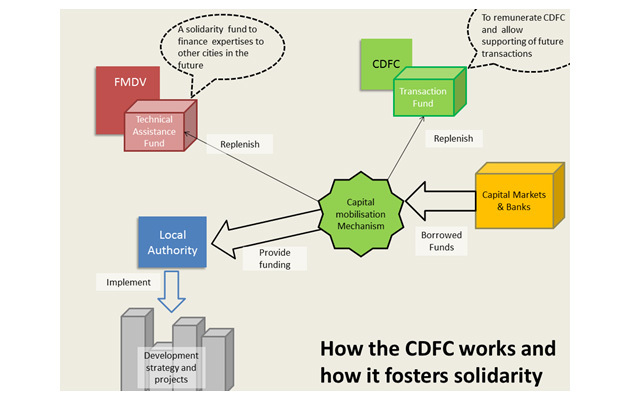 Cities that are ready to increase their financial autonomy and pursue their own development priorities can contact FMDV to explore the potential of working with the CFC.